One of a kind design for a one person lift. When time and space is limited this lift is perfect. Has two safety chains. This unit breaks down quickly and easily with only 4 wing nuts to remove. No tools are required. Measures 24"W. x 24"D. x 42"H. Can ship UPS or FedEx for lower shipping costs. 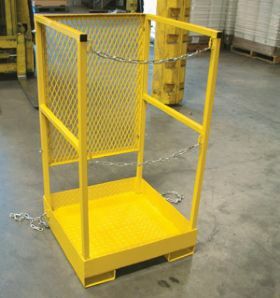 The 24" square design meets all OSHA requirements. FOB Shipping Point.